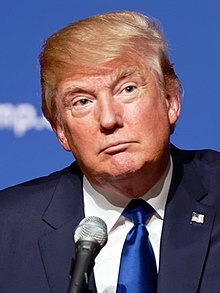 Donald John Trump ( /ˈdɒnəld dʒɒn trʌmp/; born June 14, 1946) is an American businessman, television personality, politician, and the 45th President of the United States. Trump was born and raised in the Queens borough of New York City and received a bachelor's degree in economics from the Wharton School of the University of Pennsylvania in 1968. In 1971, he took charge of his family's real estate and construction firm, Elizabeth Trump & Son, which was later renamed The Trump Organization. During his business career, Trump has built, renovated, or managed numerous office towers, hotels, casinos, and golf courses. He owned the Miss USA and Miss Universe pageants from 1996 to 2015, and has lent the use of his name to brand various products. From 2004 to 2015, he hosted The Apprentice, a reality television show on NBC. As of 2016, Forbes listed Trump as the 324th wealthiest person in the world (113th in the United States), with a net worth of $4.5 billion. Trump sought the Reform Party's presidential nomination in 2000, but withdrew before voting began. He considered running as a Republican for the 2012 election, but ultimately decided against it. In June 2015, he announced his candidacy for the 2016 election, and quickly emerged as the front-runner among 17 contenders in the Republican primaries. His final opponents suspended their campaigns in May 2016, and in July he was formally nominated at the Republican Convention. Trump's campaign received unprecedented media coverage and international attention. Many of his statements in interviews, on social media, and at campaign rallies were controversial or false. Numerous anti-Trump protests occurred during his campaign and after the election. Trump won the general election on November 8, 2016, gaining a majority of the U.S. Electoral College, while receiving a smaller share of the popular vote nationwide than Democratic nominee Hillary Clinton. At age 70, Trump will become the oldest and wealthiest person to assume the presidency. He will also be the first president without prior military or other governmental service. Trump's platform emphasizes renegotiating U.S.–China relations and free trade agreements such as NAFTA and the Trans-Pacific Partnership, strongly enforcing immigration laws, and building a wall along the U.S.–Mexico border. His other positions include pursuing energy independence while opposing climate change regulations such as the Clean Power Plan and the Paris Agreement, reforming veterans' affairs, replacing the Affordable Care Act, abolishing Common Core education standards, investing in infrastructure, simplifying the tax code while reducing taxes across the board, and imposing tariffs on imports by companies offshoring jobs. Trump advocates a largely non-interventionist approach to foreign policy while increasing military spending, "extreme vetting" of Muslim immigrants to preempt domestic Islamic terrorism, and aggressive military action against ISIS. Trump's positions have been described by scholars and commentators as populist, protectionist, and nationalist.